Mrs. Pauline Conley Smith, age 87, of Perrysburg, Ohio, formerly of Vanceburg, Kentucky, passed away Sunday, October 21, 2018, at the Manor at Perrysburg in Perrysburg, Ohio. She was born May 25, 1931, in Lewis County, Kentucky, a daughter of the late Charles and Laura Skaggs Conley. Pauline married her husband, Tracy Smith on June 23, 1949, and the couple settled in the Toledo, Ohio area to raise a family. Pauline was a resilient woman who faced all obstacles with tenacity and persistence. She is remembered by her loved ones as an artist and avid gardener, known for her special fondness for roses. In addition to her parents, she was preceded in death by her husband of 60 years, Tracy Smith; one son, Stewart Smith; three brothers, Bruce Conley, Sharon David Conley, and Leo Frank Conley; and four sisters, Velva Evans, Elsie Pierce Zornes, Juanita Stone Beddows, and Madeline Smith Beddows. 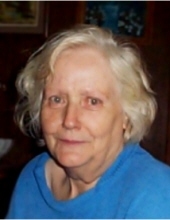 Pauline is survived by one son and daughter-in-law, Barry (Deborah) Smith of Northwood, Ohio; two grandchildren, Samantha (Mark) Biddlecom and Thomas Smith; one great granddaughter, Amelia Biddlecom; and two sisters, Alice Bloomfield of Lewis County, Kentucky, and Lily Buckner of Northwood, Ohio. She also leaves many other family members and friends who will sadly miss her. Funeral services will be held at 11 a.m. Thursday, October 25, 2018, at Globe Family Funeral Chapel in Camp Dix, Kentucky, with Brother Hansel Butler officiating. Burial will follow in the Smith-Gilliam Cemetery in Lewis County, Kentucky. Friends may visit from 6 p.m. to 8 p.m. Wednesday, October 24, 2018, and after 9 a.m. on Thursday at Globe Family Funeral Chapel, 7975 Lower Kinney Road, Vanceburg, Kentucky 41179. Pauline’s nephews will serve as pallbearers. "Email Address" would like to share the life celebration of Pauline Conley Smith. Click on the "link" to go to share a favorite memory or leave a condolence message for the family.